Regenerates enamel mineral* with regular use, protects and strengthens against cavities, for three times stronger teeth^^, helps to restore original whiteness and gives you a fresh mint sensation. Increases the effectiveness of the Advanced Toothpaste by 43%***, maximising the power of enamel mineral regeneration. *Acts on early invisible stages of enamel erosion by restoring its mineral content and micro-hardness with regular use. Clinically proven. **Based on an in vitro test measuring enamel surface micro hardness after 3 days’ combined use of toothpaste and serum. ***As demonstrated in an in-vitro test measuring enamel surface micro hardness after 3 days of combined use of Toothpaste and Serum vs Toothpaste only. ****Patents granted and patents pending. † 1 grade smoother teeth. Self-assessment test with 31 women in UK, 2013. 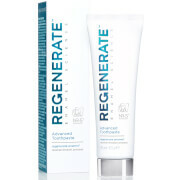 Combined use of REGENERATE Enamel Science™ Advanced Toothpaste and Boosting Serum. †† In-Vitro test measuring enamel hardness Vs standard fluoride toothpaste.